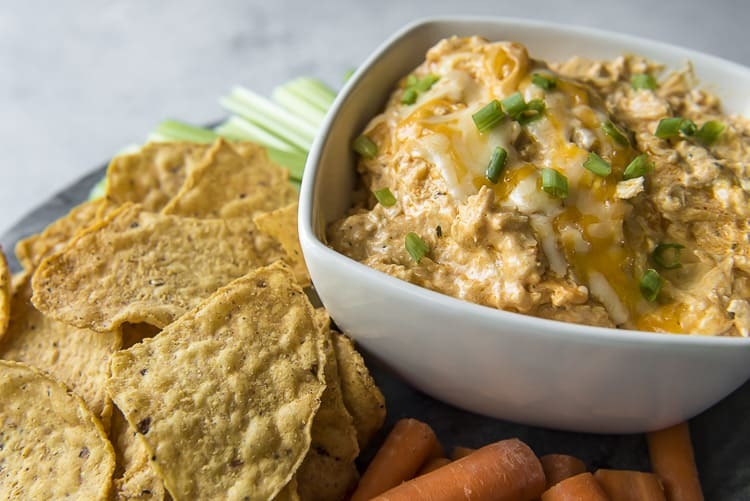 This easy, zero-prep Buffalo Chicken Dip turns a favorite bar food into a foolproof appetizer for any party, and can be made in the Crock Pot, Instant Pot, or your oven! Shredded chicken and lots of creamy cheese come together in a spicy Buffalo-ranch sauce – it’s so good, you may even chow down with a fork when the chips run out! I am low-key obsessed with this Buffalo Chicken Dip. Adapted from one of my favorite Publix Deli quick take party snacks, this recipe has been tweaked and nudged to perfection over the past few years. I’ve tried making it everywhere – from the oven to the Crock Pot to (now) my Instant Pot. Even the microwave had a shot. Every method has its perks, but I still can’t decide which way is my favorite! JUST TAKE ME TO THE BUFFALO CHICKEN DIP ALREADY! 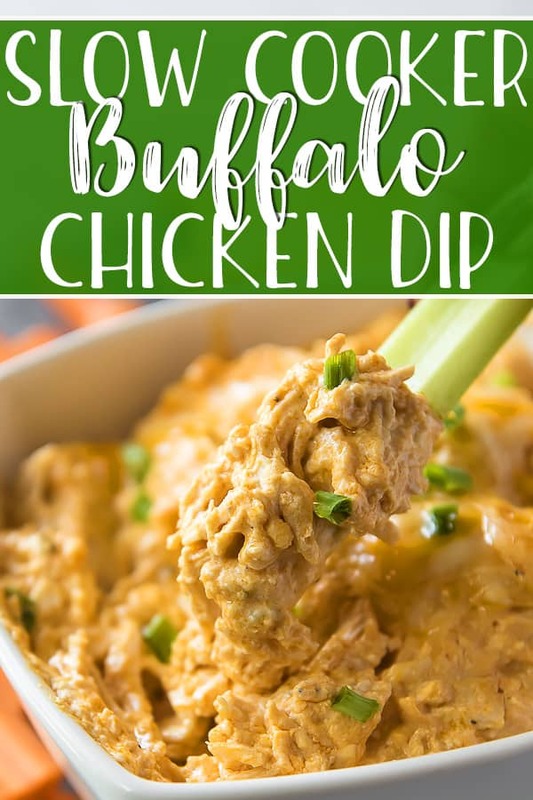 If you’d rather skip my (pretty darn helpful) tips and tricks, essential cooking info, and similar recipe ideas – and get straight to this deliciously easy crock pot Buffalo chicken dip recipe, just scroll right on down to the bottom of the page where you can find the printable recipe card! Let’s clear something up: I LOVE Buffalo chicken. I do NOT love Buffalo wings. They’re so messy and difficult to mindlessly eat when out with friends, which is the whole point of appetizers, isn’t it? 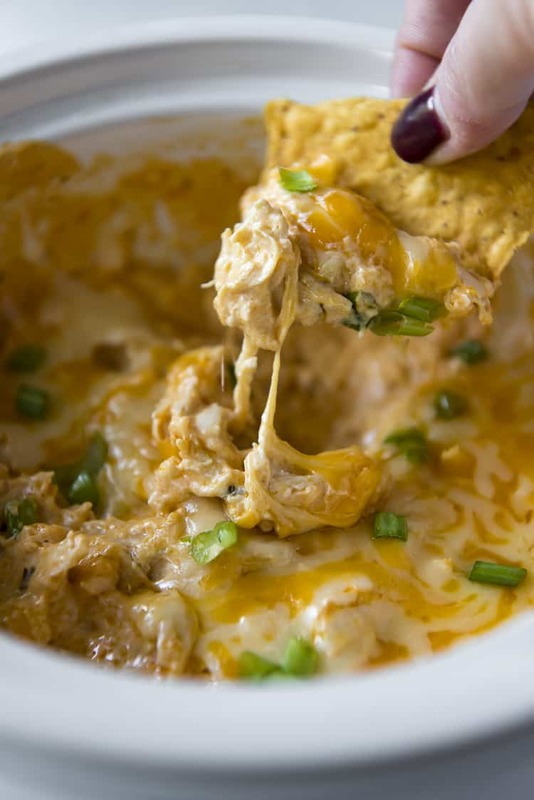 Obviously, Buffalo Chicken Dip is the superior version of Buffalo wings. All the flavor (and then some!) minus the mess. Plus you can throw some veggies and chips in the mix and turn it into a real meal. 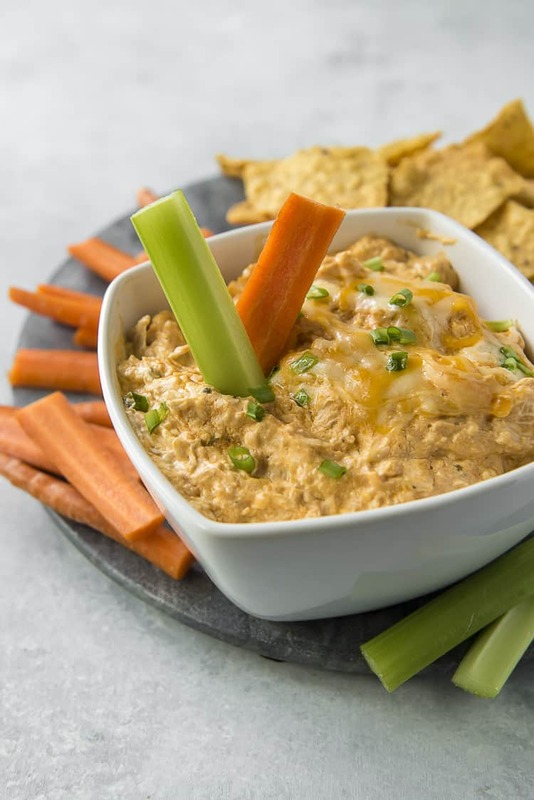 What Ingredients Are In Buffalo Chicken Dip? Shredded cooked chicken – the base of the dip, but hardly the star. Use either leftover rotisserie chicken, or cook a few breasts or thighs for the occasion. Cream cheese – player #1 in what makes this dip so creamy. Non-negotiable ingredient. Ranch dressing mix – because wings need ranch (and since blue cheese is gross). Buffalo sauce – otherwise its just a casserole. (I always go for Frank’s RedHot Wings Sauce! Cheddar cheese – inside and melted on top for that Instagrammable cheese pull. Other tasty options: colby jack, pepper jack. First, combine all of the ingredients, except for the cream cheese, in your slow cooker. Reserve some cheddar cheese for later. Stir to combine. Then, place the cubed cream cheese on top of the chicken. Close the lid and cook 1-2 hours on low, until the cheese is melted and everything has come together in a gooey, chunky dip. Stir it up, then sprinkle the remaining cheddar on top. Finally, close the lid for a few more minutes and allow the cheese to melt. Garnish with green onion and serve with carrot & celery sticks and/or tortilla chips. First, place the frozen chicken in the inner pot of the Instant Pot, along with the Buffalo sauce and 1/4 cup water. Next, seal the lid and pressure valve and cook on Manual High for 10 minutes. Press Cancel and perform a quick pressure release. Remove the lid carefully and press Saute Low. Then, add remaining ingredients (minus 1/2 cup cheddar, plus extra Buffalo sauce to taste if desired) and stir well. Allow the cheeses to melt, mixing frequently to prevent scorching. Sprinkle reserved cheddar on top, loosely close the lid and allow to melt. 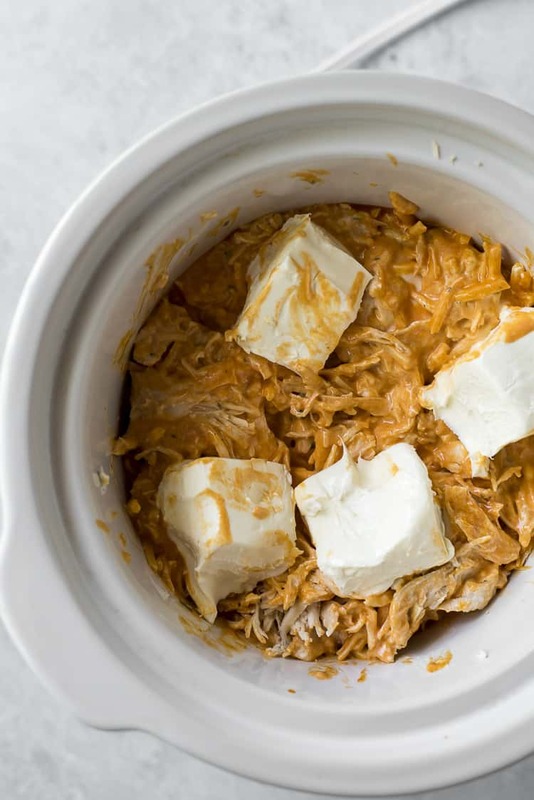 First, combine all of the ingredients in the inner pot of the Instant Pot, with the cubed cream cheese on top (reserve 1/2 cup of cheddar for later.) Stir to combine. Seal the lid and pressure valve and cook on Manual High for 0 minutes (just enough to melt the cheeses). Press Cancel and perform a quick pressure release. Remove the lid carefully. Then, stir well and sprinkle reserved cheddar on top. Close lid and allow cheddar to melt. First, preheat your oven to 350 degrees F.
Lightly spray a casserole dish with cooking spray and set aside. Next, combine all ingredients in a large bowl, stirring well to combine. Reserve some of the cheddar for the top. Then, transfer the mixture to the prepared casserole dish. Spread it into an even layer and sprinkle the reserved cheddar on top. Bake for 18-20 minutes, until the cheese is hot and bubbly. 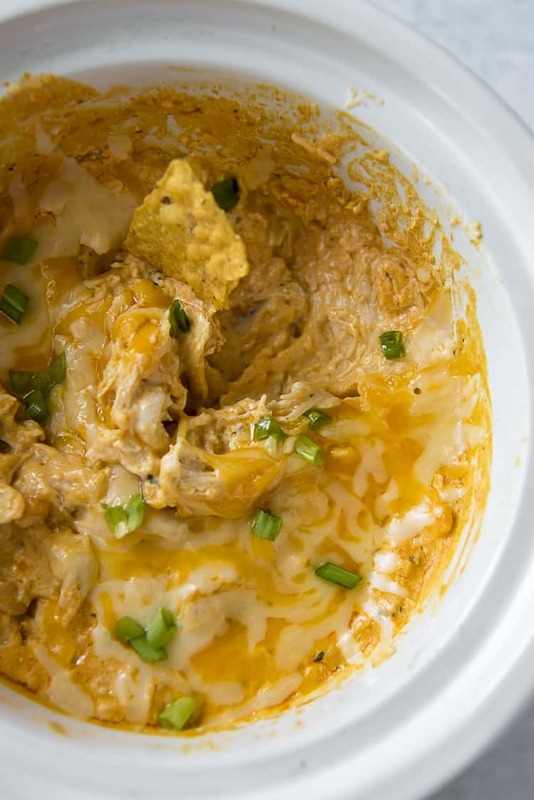 Can You Freeze Buffalo Chicken Dip? Yep! Place the cooked dip (minus the top cheese) in a freezer safe bowl with a lid. Secure the lid and freeze for up to 3 months. When ready to serve, remove from the freezer 30 minutes before cooking. Follow cooking instructions for chosen appliance. How Long Can Buffalo Chicken Dip Sit Out? The dip should be kept warm (140 degrees F) in the crock pot during the festivities for no more than 4 hours. If it’s on the table out of the crock pot, it must be refrigerated after 2 hours max. If you’re worried about foodborne illness, refrigerate the dip after 2 hours. Transfer any leftover dip to a large container with a lid and store it in the refrigerator for 3-5 days. When ready to serve, either microwave or follow oven instructions to reheat. What Is Good To Eat With Buffalo Chicken Dip? This dip would also be delicious on top of pizza, in a sandwich, or on a salad! 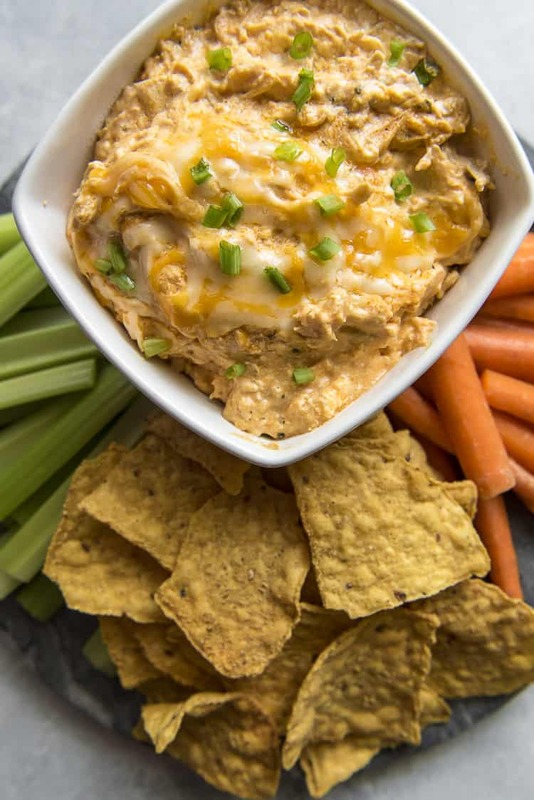 Is Buffalo Chicken Dip Keto? 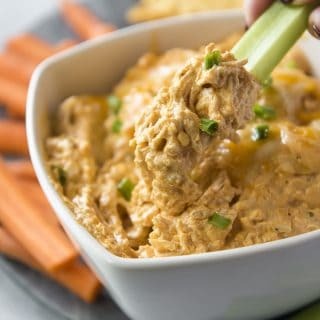 Yes, this Buffalo Chicken Dip is a perfect keto appetizer! It is low in carbohydrates and high in fat. Serve it with celery, raw broccoli or cauliflower, or baked lavash chips. LOOKING FOR MORE CHICKEN APPETIZER RECIPES? 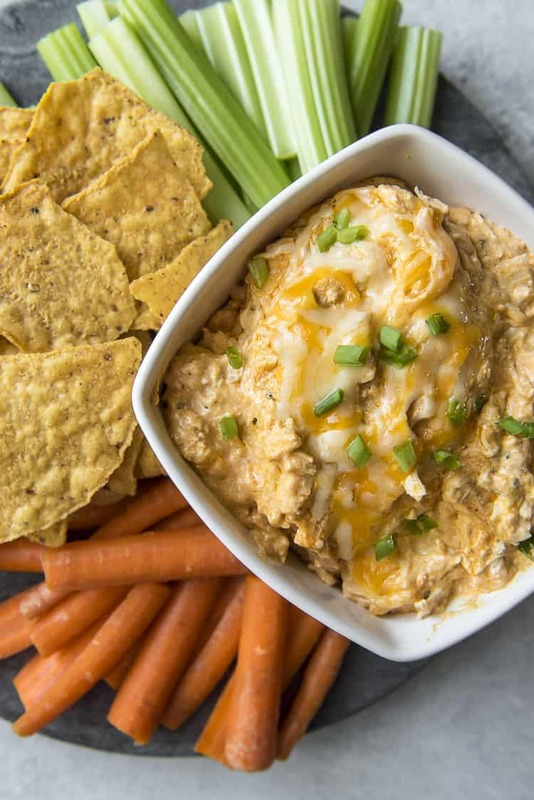 This easy, zero-prep Buffalo Chicken Dip turns a favorite bar food into a foolproof appetizer for any party and can be made in the Crock Pot, Instant Pot, or your oven! Shredded chicken and lots of creamy cheese come together in a spicy Buffalo-ranch sauce - it's so good, you may even chow down with a fork when the chips run out! 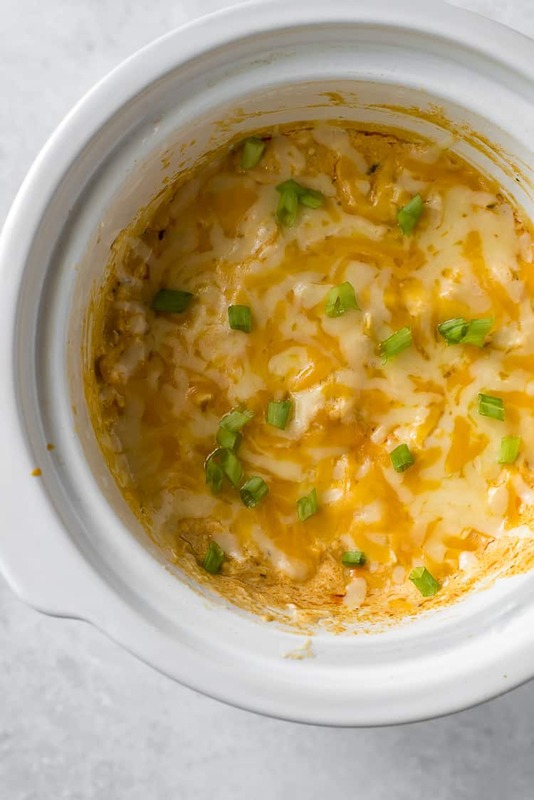 Combine all ingredients except cream cheese in the crock of a slow cooker, reserving 1/2 cup of cheddar for the top. Stir to combine. Place the cubes of cream cheese on top of the mixture. Close the lid and cook 1-2 hours on low, until cheeses are melted. Stir well, then sprinkle remaining cheddar on top. Close lid and allow cheddar to melt. Garnish with green onion if desired, then serve with carrot & celery sticks and/or tortilla chips. Place whole chicken breasts in the inner pot of the Instant Pot, along with 1 cup of water. Seal the lid and valve and cook on Manual High for 10 minutes. Press Cancel and perform a quick pressure release. Remove the lid and transfer the chicken to a mixing bowl. Carefully discard the water from the inner pot and return it to the cooker. Shred the chicken, then return it to the pot. Press Saute Low. Add cream cheese, sour cream, ranch mix, 1 cup of cheddar, and Buffalo sauce (feel free to add more than 1/2 cup if you want to). Allow cheeses to melt, mixing occasionally to help combine. When well mixed, sprinkle remaining cheddar on top. Close lid and allow cheddar to melt. Garnish with green onion if desired, then serve with carrot & celery sticks and/or tortilla chips. Pour Buffalo sauce and 1/4 cup water in the inner pot of the Instant Pot. 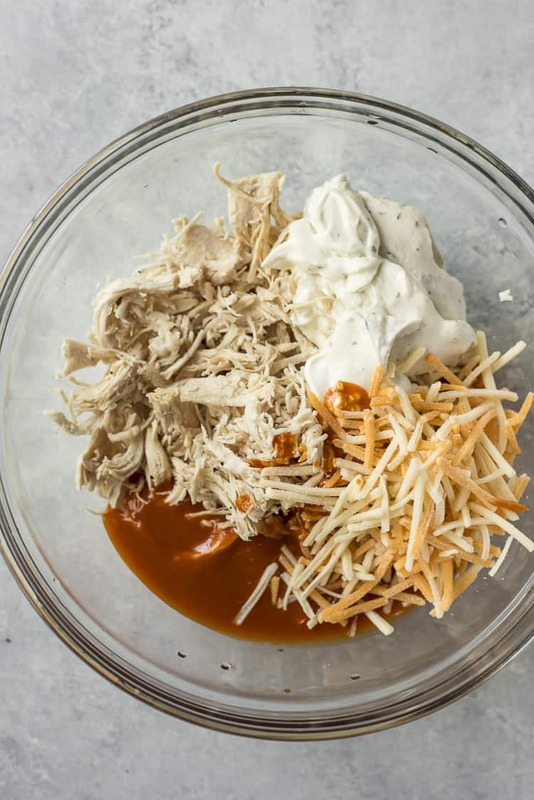 Layer in the cooked chicken (pre-shredded), then add ranch mix, sour cream, cream cheese, and 1 cup of cheddar on top. Seal the lid and valve and cook on Manual High for 0 minutes (yes - that's ZERO minutes - just for pressure building purposes). Press Cancel and perform a quick pressure release. Remove the lid carefully. Stir well until combined, then sprinkle remaining 1/2 cup cheddar on top. Close lid and allow cheddar to melt. Garnish with green onion if desired, then serve with carrot & celery sticks and/or tortilla chips. Preheat oven to 350 degrees F. Lightly spray a casserole dish with cooking spray and set aside. Combine all ingredients in a large bowl, stirring well to combine, reserving 1/2 cup of cheddar for the top. Transfer the contents of the bowl to prepared casserole dish. Sprinkle the remaining cheddar on top. Bake for 18-20 minutes, until the cheese is hot and bubbly. Garnish with green onion if desired, then serve with carrot & celery sticks and/or tortilla chips. 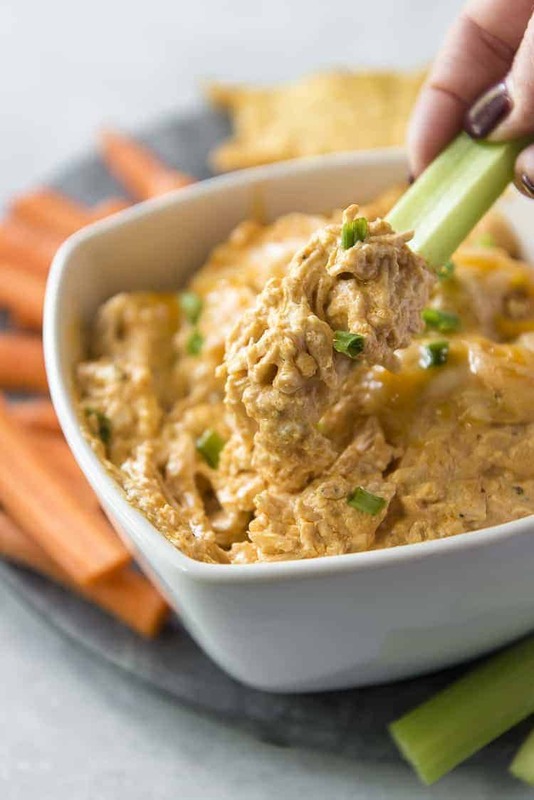 PIN THIS BUFFALO CHICKEN DIP FOR LATER! Hi Aideen! I’m so sorry to hear you’re having Instant Pot woes! I haven’t had a burn or overheat problem myself, but it could be one of a few things. Were you using cooked or frozen chicken? With frozen, I have 1/4 cup water added to the instructions for that particular method, but it isn’t in the ingredients list – did you add that? If it was cooked, make sure you put the hot sauce in first, then layer the chicken and everything else on top of it. Did you make sure the venting knob was turned to sealing? If it’s not sealed, any liquid that IS in the pot escapes as steams and burns up. Also, make sure your sealing ring is properly fitted in the lid, as that can effect how much steam escapes, also. I hope this helps, and thanks for bringing it to my attention – I’ll update the instructions a bit to avoid this problem for anyone else! Thank you for the reply. I used it for a couple of other recipes and put in more liquid and ensured proper sealing and it didn’t burn, yay. However, i literally just msde this again and again, put in more liquid, ensured it was sealed but it burnt again 🙁 Maybe even more liquid? I’m afraid it will be runny though. I did also just use the pot to cook rhe chicken beforehand, is ir possible it was too hot? It’s still edible anyway, haha. That is so very odd to hear, Aideen! I actually made this again today for a Super Bowl party and I didn’t have any problems. I did do a little research and have a solution to try (I updated the recipe to reflect these changes) – add 1 cup of water with the chicken breasts when cooking, then transfer the chicken to a bowl to shred, and discard the water. Then follow the rest of the recipe, stirring in the remaining ingredients until it’s all combined. I truly hope this works better for you, and I’m so SO sorry you’ve had such trouble with it!